For a manicure or pedicure and friendly chat, try Beauty at your Fingertips. Julie will come to your home and leave your hands and/or feet looking and feeling beautiful! Julie is well-qualified and keeps her skills up to date and the products she uses are wonderful! Thoroughly recommended! 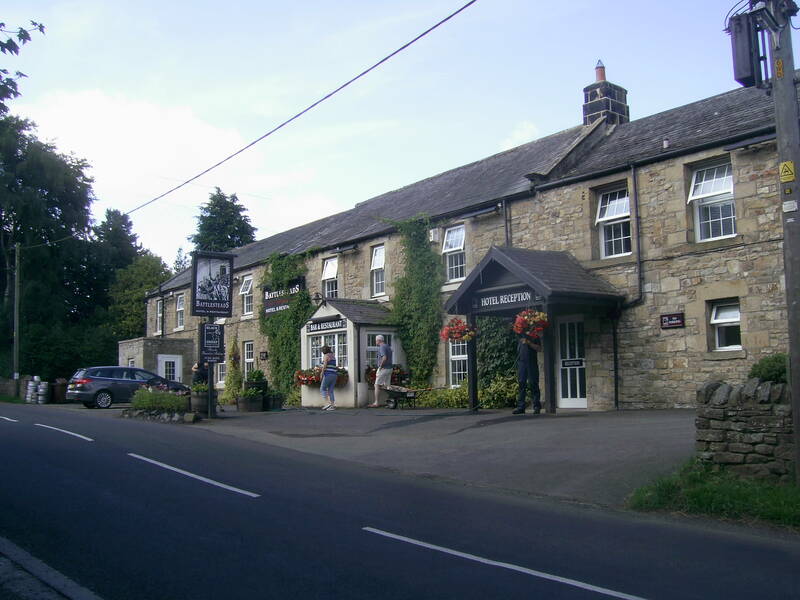 Battlesteads is officially a hotel and restaurant although it’s in effect a pub with rooms and very good it is too, being accessible, eco-aware and dog-friendly. We had a ground floor room with an adapted bathroom ie it had shower seat and grabrails and the room, although pretty compact had a couple of chairs. There were very nice biscuits and a bowl of fruit and they made it clear they were happy to provide fresh milk – I can’t imagine wanting a cuppa made with ‘plastic’ UHT milk! The whole of the ground floor was accessible – a couple of tight turns but nothing my scooter couldn’t handle. The décor was traditional pub style but with lots of great railway posters on the walls, advertising local attractions. Dinner was tasty, not gourmet but not stuff we’d cook at home, so fine by me! Breakfast was good too, we had smoked salmon and scrambled eggs but they did the full English and various other cooked options plus some ‘continental’ choices – ham and cheese, some fruit but not a great deal else. It was served in the conservatory, which was pleasant and would normally have a view of the garden but this was mainly taken up with gazebos for their forthcoming beer festival. The staff were mainly Eastern European and were very pleasant and efficient. When we checked out it seemed to be the owners we were dealing with – they were local anyway and very jolly and friendly too. I would definitely stay here again – for further details on accessibility, see my reviews on accessibilityreviews.org or Euan’s Guide. The next day we headed through gorgeous, rolling scenery and made our way to Peebles and Cringletie House with a brief stop at Galashiels’ Tesco for a newspaper and also via a short detour to see the famous gates of Traquair House which were closed after a visit by Bonnie Prince Charlie in 1745 to only be reopened when there is a Stuart on the throne! accessible but it is! Getting to the ground floor involved a platform lift, other than that, it was all level or you used the normal lift to get to the first floor restaurant. For more details on this, see my review or look on Euan’s Guide. The restaurant has fabulous views and the food was pretty good too – we had a late lunch then dinner later and both were good without being fabulous. The dinner included various ‘amuse-bouches’ which were actually better than the starter, but what with the jolly staff, the great view and a nice glass of wine, the whole experience was excellent! Breakfast again was ‘good in parts’ – I ordered scrambled egg and while what I had was perfectly nice, it was much more akin to an omelette. Pete’s full breakfast was suitably filling! 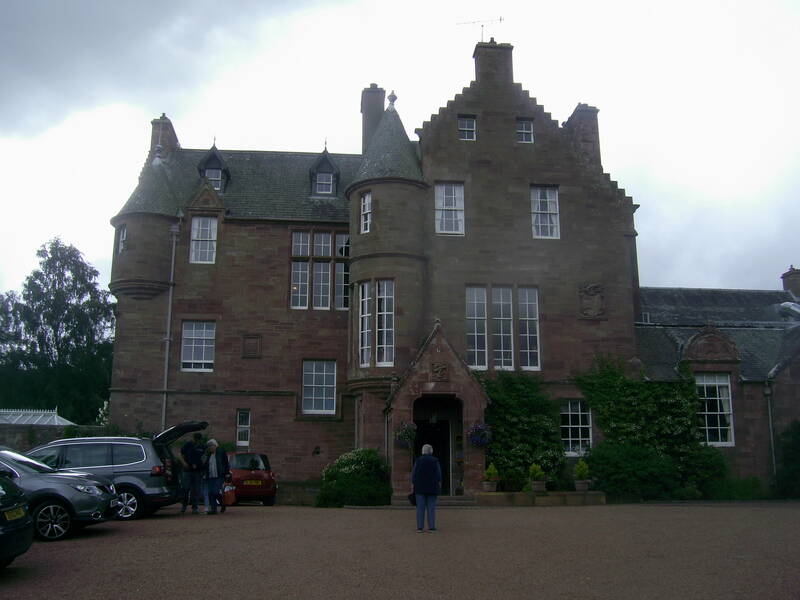 The room, Traquair, a junior suite, was spacious and pleasant and we had fun playing with the ‘rise and recline’ chairs! The bathroom was spacious with a walk-in shower, grabrails etc and lovely toiletries. There seems to be a trend away from little bottles of toiletries – all the places we stayed had large bottles of very good shower gel etc that you use but leave in place – much greener than all those small plastic bottles. The grounds look lovely – it was a bit chilly to explore but they looked good from inside! needed to know and answered our questions about accessible things to do and made it clear they were there to help if we needed anything. There was a ‘welcome pack’ of a bottle of wine, cheese and oatcakes, local fudge, chocolates, milk in the fridge and tea and coffee supplies as well as fresh flowers! track and as if by magic, the sun came out just as we got out of the car! From the carpark you could go in two directions for a fairly short distance before the (beautifully smooth!) track joined the road so we pootled along admiring the wild flowers then came to a viewing point with a great view of the sea. We back tracked and came upon an information board near the carpark explaining how the track was part of a disused railway line. You could follow it for miles but in places it is right next to the road or actually joins the road so we left that to the many cyclists who were following it – some complete with back packs, camping gear, the works! drizzle, it’s one of the most fabulous settings imaginable for a castle (it was used in Monty Python and the Holy Grail, apparently!) and visited Dunstaffnage Castle (the sun obligingly came out again as we arrived!) 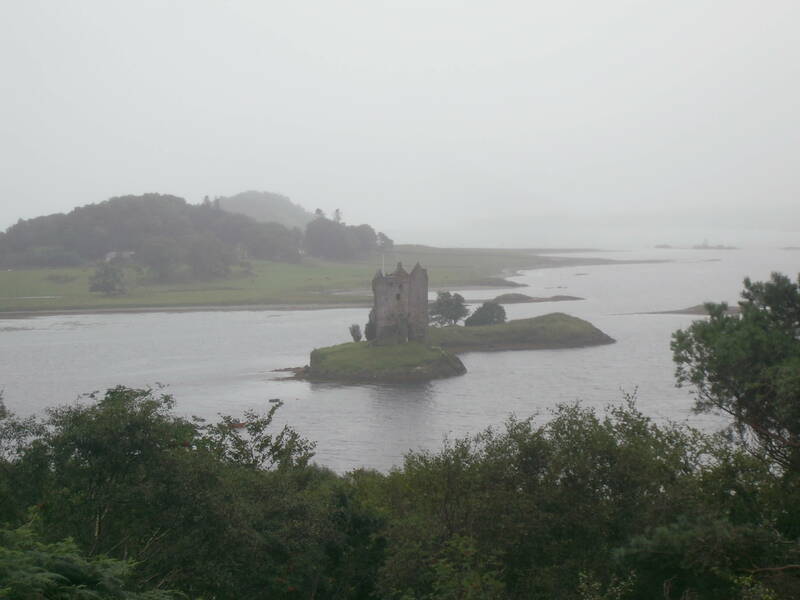 which has a terrific setting by the harbour and we also did a gorgeous drive along the side of Loch Etive. Our return from that was blocked by some stubborn cows until a lorry driver who came along advised driving at them rapidly! We let him do that and we followed him through – it worked! We got a chance to try out the lodge’s verandah one splendidly sunny afternoon and watched the swallows flying in and out to their nests above the French windows. The week went all too fast then it was time to move on to the next adventure. We decided to take a different route to our next destination and went via Loch Lomond. 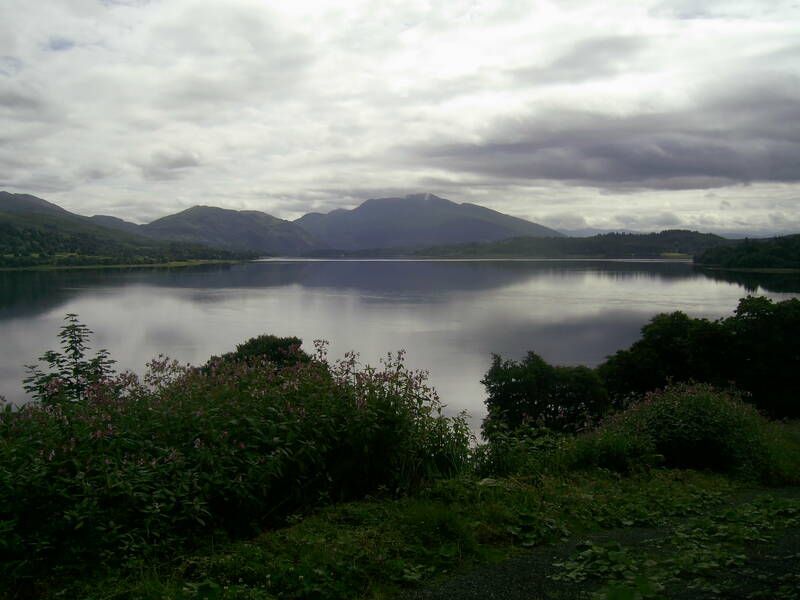 The drive there via Inveraray and Loch Fyne was through absolutely beautiful scenery. Once we were at Loch Lomond, this being a sunny Saturday, you could see how it is a popular daytrip from Glasgow – the traffic going the opposite way to us was really heavy! Next it was motorways to get us around Glasgow, then we found our way to New Lanark, home of New Lanark Mill Hotel, mainly associated with Robert Owen, an enlightened factory owner in the style of Titus Salt or the Rowntrees, which is now a World Heritage Site, with a visitor centre and hotel. added to the atmosphere – I can imagine in rainy weather it might look a little bleak to some, but generally the effect was charming. Who could resist somewhere with an ‘Institute for the formation of character’? After checking in someone came to our room to explain the emergency evacuation procedure which was an interesting touch – never experienced that before in a hotel. After having some lunch, we explored the site with its great views of the Falls of Clyde and later had dinner in the restaurant which has quite an imaginative menu and was jolly good. It was really interesting how elements of the mill buildings are incorporated into the hotel and restaurant. The rooms are actually a bit bland, but the bathroom had a solid iron post, part of the original fabric, and there were iron braces in the vaulted ceiling, plus there are gorgeous photos everywhere of the mill at all times of year. It’s all easily accessible, and again, the staff were all very good about accommodating you – no fuss made, for example, when we preferred to sit at a different table to the one they directed us to a breakfast, which, as I’ve said before, is just how it should be. Here’s my full review and my Euan’s Guide review. From there we headed back to York and were surprised it only took four hours! Breezy Knees is a garden, nursery and café at Stockton on the Forest near York which I had heard of a while ago but was somewhat put off by the silly name. 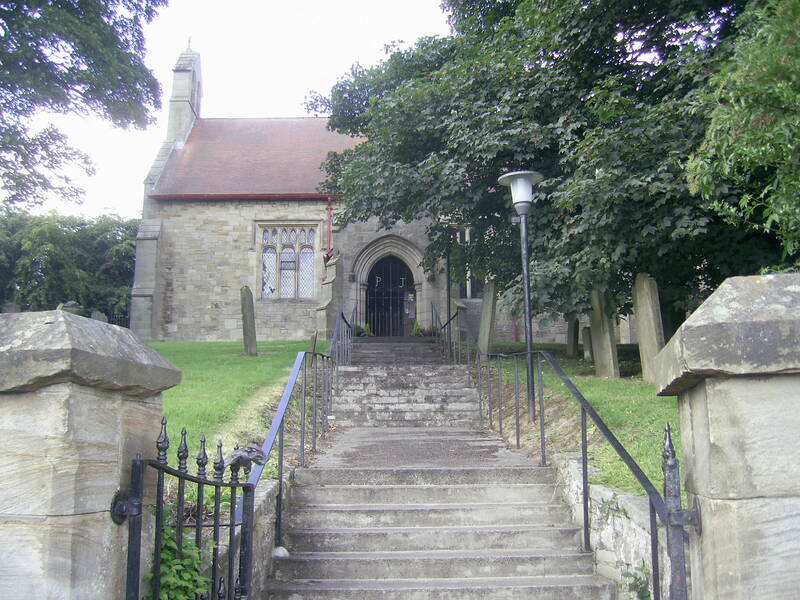 However, we’d been told it was good so thought we would go and – wow! It’s lovely! The café seems to be quite a draw judging by the numbers of people –we didn’t sample it so I can’t comment! – but the gardens are extensive enough that it didn’t feel remotely crowded despite the numbers. The different areas are separated by fences or hedges and you can visit gardens for different times of the year plus the beautifully scented rose garden, the shade garden, rock garden, cottage garden and many more, including fountains and ponds. The paths are mainly tarmac or fine gravel, some are rougher gravel and some are grass – this was a bit bumpy for comfort but we didn’t have to go that way, we could have back tracked and stayed on the smoother paths. There are also plenty of benches. It’s all accessible apart from a couple of sections, which the staff explained and marked on the map for us but there was plenty to see anyway. The café is accessible too – also lots of the seating is outside and there is an accessible loo, although this was a little tight for the scooter I was using which is 50cm wide There is ample parking with some reserved for blue badge holders. I can definitely see us going for a return visit – you can get a season ticket which would make it worthwhile if you planned to visit four or more times a year. A couple of other places to visit in or near York are Rowntree Park, Moorlands and Askham Bog. 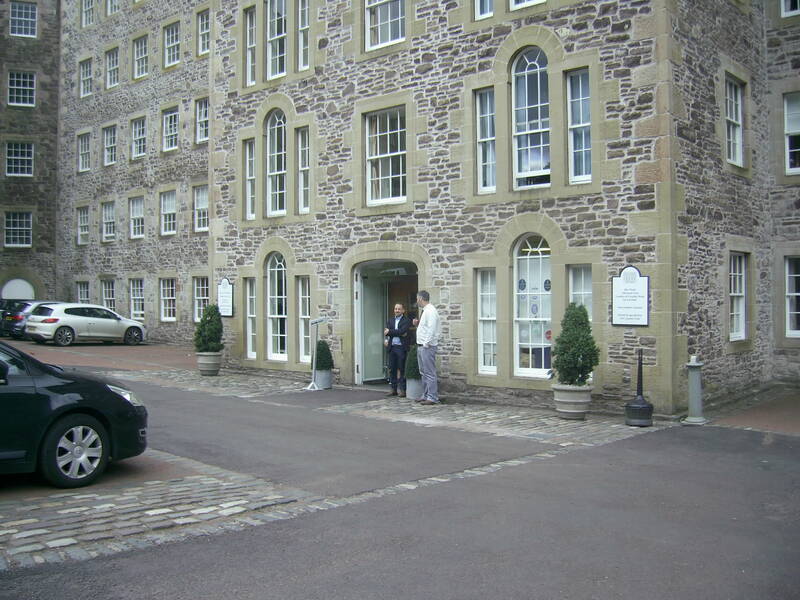 We stayed one night at New Lanark Mills on our way back from Scotland to home but it’s worth spending more time here as it’s not just a hotel but a World Heritage site with a visitor centre and plenty to see. The hotel is in one of the old mill buildings and the rooms incorporate original features which add a bit of character to the otherwise fairly bland bedrooms. 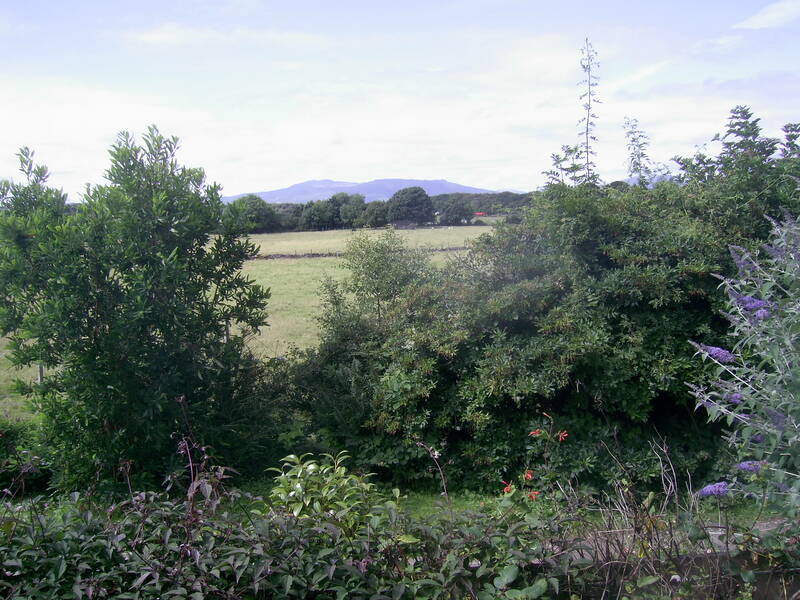 They are comfy enough and have good views and gorgeous photos of the site, which is by the Clyde and its waterfalls. We had booked an accessible room, so the bathroom was wetroom style with shower seat and grabrails. After we checked in, someone appeared to explain the emergency evacuation procedure, which I have never experienced before, but it was good to know. There was a wedding going on but that didn’t impinge on our stay other than some guests’ children bashing on the piano rather tediously during dinner! Dinner was very good as was breakfast with plenty of choices – better on the cooked stuff than the continental, as ever. Staff were really pleasant and helpful and the whole place is accessible, if a little uneven outside. There was a speed hump with a notice by it asking people not to park by it as it had a gap so wheelchair users could get by, but guess what? White van parked right in the gap! Managed to get over the hump anyway and the van had gone by the time we came back from seeing the falls, the millrace and other features. It doesn’t affect entry to the hotel. Inside there was a bar (rather loud radio) and lounge (sunny and pleasant) as well as the restaurant and it’s all very easy to get about – they’ve obviously put some thought into access issues and staff were happy to let you sit wherever suited you best. Definitely recommended for somewhere a little different to stay. 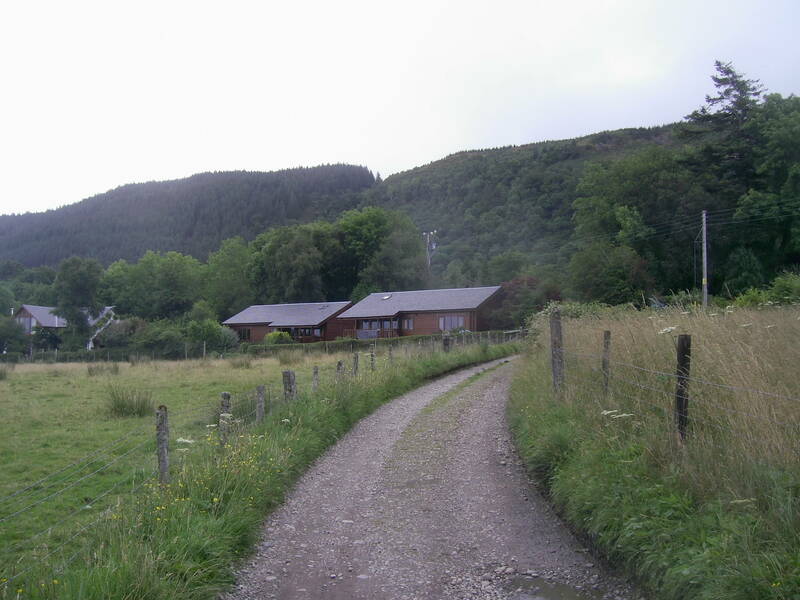 Other places we stayed on this holiday are Battlesteads, Cringletie House and Port Selma Lodges. Port Selma lodges are two wonderful wooden chalets in a lovely, quiet location with wonderful views which happen to be fully accessible! The pictures on the website don’t do justice to how beautifully done and well-maintained they are. The owners live over the way and obviously look after them carefully and provide everything you could possible want in a holiday cottage as well as leaving you a welcome tray with a bottle of wine, cheese, oatcakes and other goodies, a pint of milk in the fridge and even fresh flowers! Both lodges comprise a double bedroom with en suite wetroom bathroom with grabrails and a moveable showerseat, plus a twin room and a bathroom with shower over the bath; a sitting/dining room/kitchen and a verandah, all accessible (there is a ramp to the front door) and there is more outside sitting space for if you wanted to dine outdoors. Willie and Jan Orr, the owners, met us when we arrived and had advice on accessible things to do in the area such as the nearby cycle track and made it clear they were happy to be contacted if we needed them. Their website gives quite a lot of information about things to do such as ferry trips, cafés and so on. We mainly drove around and took in the lovely views, which weren’t spoiled by the rather poor weather at the start of the week – as ever with Britain, you have to grab your moments! 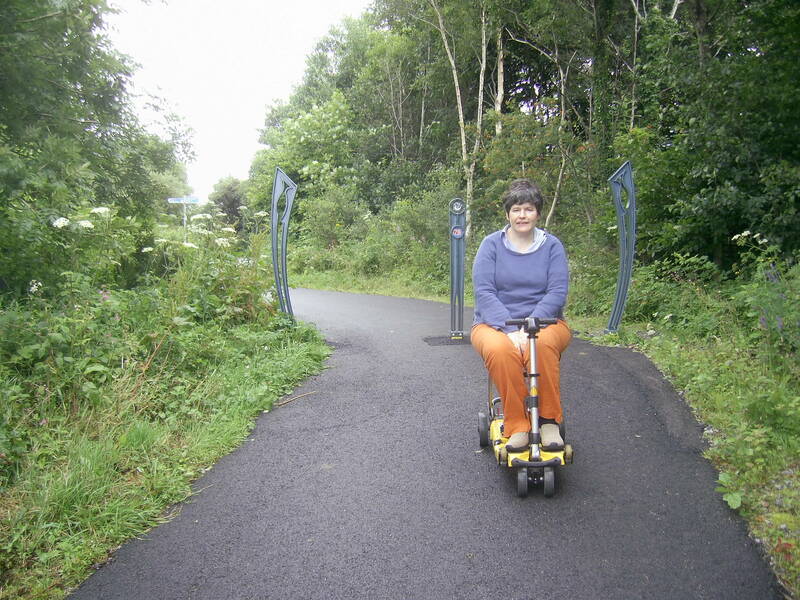 There is a cycle track nearby which you can scoot along and get to a viewing point with lovely sea views, there’s an accessible café with wonderful views of Castle Stalker and we visited Dunstaffnage Castle in its harbourslde setting. We had a thoroughly relaxing week – the sun even put in an appearance and we had at least one fabulous sunset – the lodge faces west. 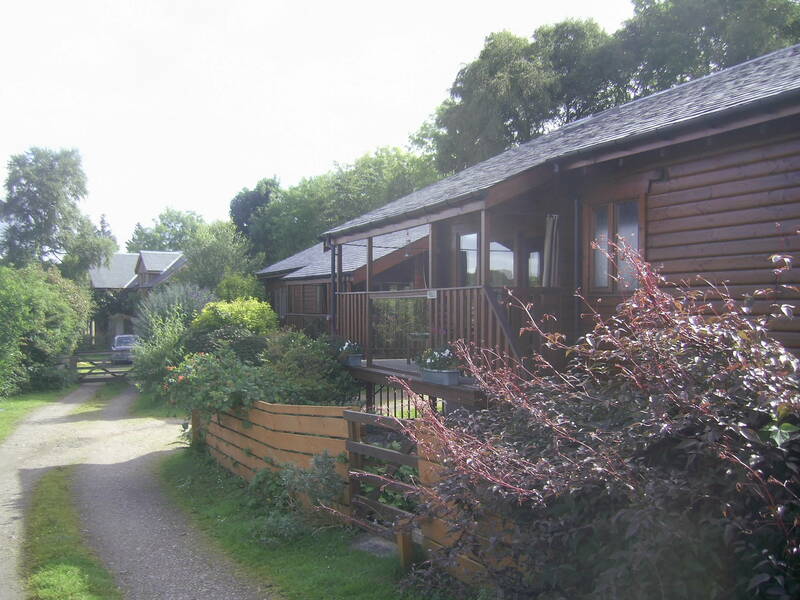 I found the lodges because of a review on Euan’s Guide which gave a great description and confirmed the good impression I had from the owners’ website. Definitely a recommended place to stay! viewing platforms which jut out to give good views of the river, there are often rowers to watch or people to wave at on the pleasure boats and it’s all so green and pleasant! The cycle path heading from the bridge out towards Bishopthorpe is a little bumpy in places where tree roots have raised the tarmac but nothing too drastic and of course, you need to be aware of cyclists coming along! Heading the other way takes you to Rowntree Park or you could head right along towards the city centre on either side of the river. The park is looking lovely just now with roses and clematis on the pergola and the herbaceous borders, if not quite so well-tended as they once were, are still full of colour. The café was busy with people enjoying the view, the kids’ play areas were in full swing and families and dog-walkers were all enjoying this splendid park! See my general review of Rowntree Park and of the park in spring. They can when they are Cringletie House in the Scottish borders! 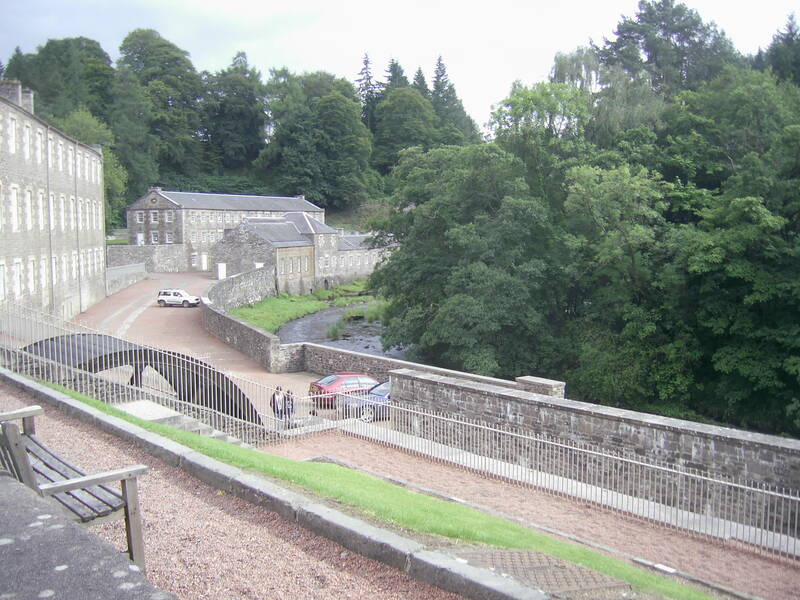 It’s a luxurious country house near Peebles with a great restaurant and lovely staff. I can’t really comment on the grounds as the weather was a bit too drizzly to explore but they look very nice! When you arrive there is a ramped entrance then a platform lift to get you up the three steps to the ground floor – not possible with my scooter because of how the lift is situated but it had a seat so I could get off the scooter then back on at the top. We got a very warm welcome, in fact all the staff were great, and as our room wasn’t ready (we were quite early) we headed to the restaurant for some lunch. After that we were shown our room which was actually a junior suite so had a couple of armchairs (the rise and recline sort which was fun to play with!) – the website talks of them having just one accessible room but it sounded like they had more than one – they were on the ground floor while there was lift access to the first floor restaurant which has fabulous views. The room was spacious and comfortable with a large bathroom with roll-in shower, grabrails etc. In fact, they have made huge efforts to make the place disabled-friendly without that impinging on the style and comfort of the place for everyone. As I said above, the weather wasn’t really appropriate for exploring outside and some of the paths don’t look very suitable but I can’t really comment! Dinner was very good – several ‘amuse-bouches’ to start with; not terribly good fishcakes then a lovely fish main course and we even found room for dessert as none of the dishes were huge or stodgy. Breakfast was good although my scrambled eggs very much resembled omelette! On leaving, the platform lift once again came into play – I could scoot on to it but not off, so a chair was fetched so I could get off and have a seat while Pete manhandled my scooter into position! It was quite pricey but I would love to go back to such a lovely place where they just take it in their stride that you use a scooter – no one stares or makes a big deal of it, which is just how it should be! Have a look at my reviews of other accessible places to stay!